The first time that I saw a Hummingbird Moth I was living in Paducah (2008/09) which is in Western Kentucky. It was my first summer there (I only lived there for sixteen months) and I was standing on my back deck that had Glossy Abelia bushes right in front of it. I heard a humming type noise so I looked into these flowering bushes and saw at least twenty or more of them flying all around. At first glance I thought that they were hummingbirds as they were hovering at the flowers, feeding on the nectar just like hummingbirds do. I was so excited thinking that this was a new species of hummingbird that I had never seen before. That is until I looked them up on the internet and found out that they were actually Hummingbird Moths. Still, what a delight to have! Lucky for me I have been able to attract the Hummingbird Moth to my garden in Northern Kentucky but for some reason they are not as abundant as they were in Western Kentucky. Still working on attracting more though. Read on for some interesting facts about this little beauty…. Hummingbird Moths can be found throughout North America in gardens, meadows, and near woodlands. 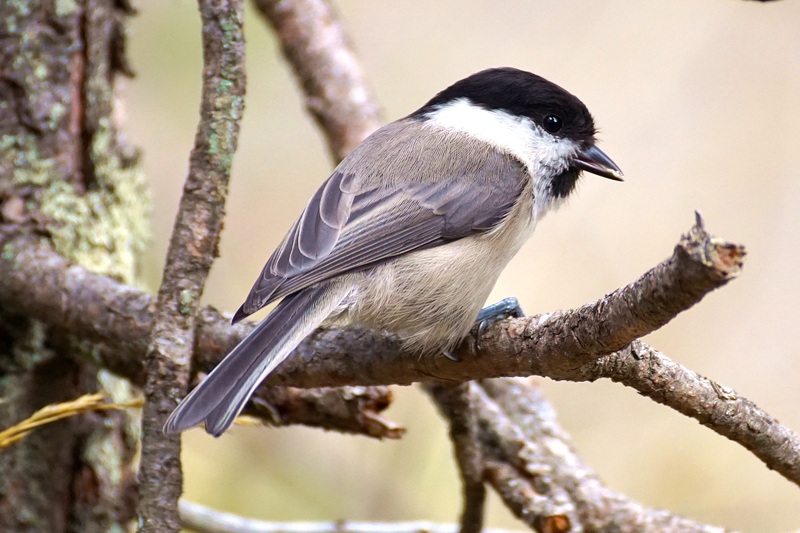 They feed on the same flowers and bushes as hummingbirds which are Bee Balm, Petunias, Geraniums, Butterfly Bushes, Nasturdium, Verbena, Lavender, just to name a few. Hummingbird Moths feed during the heat of the day (unlike other moths) and into the evening hours. I have found that you can see them about the same time every day in the garden. They are much easier to photograph than a hummingbird as they do not seem to mind if you get too close to them and won’t fly away. This moth is an olive green color with reddish brown scaly type wings. It’s tongue or beak-like hollow tube, called a proboscis, is several inches long and is used to drink the nectar from plants. As with all moths and butterflies the Hummingbird Moth has a four part life cycle: egg, caterpillar, cocoon, adult. They need certain plants for this reproduction. The best host plants are viburnum, coralberry, and dwarf honeysuckle. Adding these to your garden is a good way to attract them. In the northern parts the Hummingbird Moth has only one generation April to August, however in the south they have two generations – March to June and August to October. The Hummingbird Clearwing Moth (its official name) is more common in the eastern half of North America and the Snowberry Clearwing Moth (also called a Hummingbird Moth) is more common in the western half. Both look very similar. Hummingbird Moths hum like hummingbirds, hover like hummingbirds, and feed on the same flowering plants as hummingbirds. This moth is one to two inches in length compared to three to up to five and a half inches for hummingbirds. The caterpillar is green with dark red spots on it with a horn-like appendage at the rear. The Hummingbird Moth is of the Sphinx Moth family. It only lives for a few weeks as compared to the hummingbird which lives from three to five years. The Hummingbird Moth may fool you when you first see it as it looks, acts, feeds on the same plants, and sounds just like a hummingbird. However, that is about the end of their similarity. The moth has a proboscis, which is a hollow type tube that looks like a beak but is not. Hummingbirds have beaks. 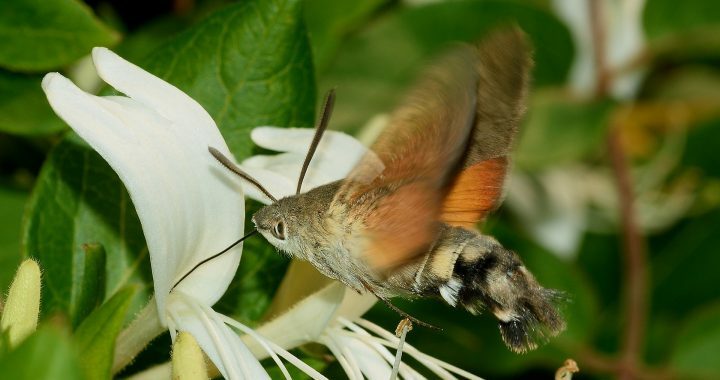 The Hummingbird Moth does not have feathers like the hummingbird, and will only live a few weeks as compared to the hummingbird that may live from three to five years. There is also a size different as the moth is about half the size of a hummingbird. This moth requires specific host plants for reproduction and the best ones are the viburnum, coralberry, and dwarf honeysuckle. Having these plants in your garden will help to attract this interesting moth along with nectar producing plants such as the Butterfly Bush, Lavender, Bee Balm, Petunias, Geraniums, Butterfly Bushes, Nasturdium, and Verbena just to name a few. 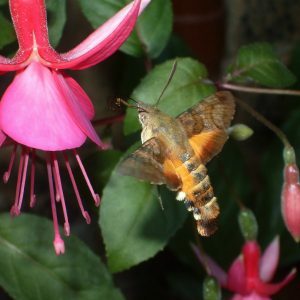 Some people have reported that the Hummingbird Moth may become a problem in your garden if they become more abundant as they may destroy plants. I did not notice this when I had plenty of them in my garden in Paducah, Kentucky. However, maybe it takes a lot more of them for this to happen I do not know. As far as I am concerned, they are welcome as I only get a few anyway. Please let me know your experience with this moth whether it be positive or negative. I would really be interested in hearing about it. You can make your comments below. Thank you! Posted in Attract Butterflies, In The Garden and tagged hummingbird moth. ← Why Do Hummingbirds Fight?